Home News Middle-East Do “leaderless” revolts contain seeds of own failure? Do “leaderless” revolts contain seeds of own failure? From the streets of Cairo and Madrid to online forums and social media sites, “leaderless” protests are on the rise. But the very qualities that led to their short-term success may condemn them to failure in the long run. Activists in Egypt, Tunisia and elsewhere say the lack of top-down management has been an important element in their recent success in rallying crowds disillusioned with the ruling establishment, using social networking sites like Twitter and Facebook. Anti-austerity protesters in Europe have used similar tactics to organise mass street protests they hope will put pressure on governments to rethink spending cuts. It’s not all online. In street demonstrations, sit-ins and meetings in Cairo, Athens, Madrid and London, loosely organised protesters hold public meetings and votes on immediate logistical issues and wider political aims, trying to build agreement and consensus. 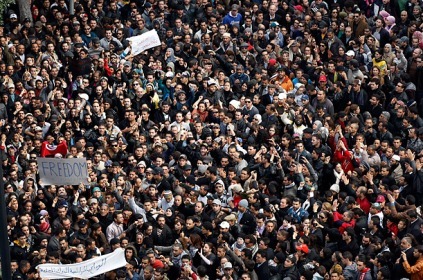 “Our revolution did not have a head but it did have a body, a heart and a soul,” Egyptian-British psychiatrist Sally Moore, one of the protesters in Cairo’s Tahrir Square, told a Thomson Reuters Foundation event this month on the “Arab spring”. Disparate protest groups around the world say they are learning from each other. While in previous decades leaderless groups struggled to build name-recognition and media coverage, social media has allowed them to put huge crowds on the street at speed. It’s a model that has proved very appealing to youthful protesters angry at her the way they believe an older generation — whether the leaders of the Arab world or West’s bankers and politicians — have stolen their future. “You will still have a core group of several dozen or more people who will provide a lot of direction, but the rhetoric is very much against the emergence of traditional power structures,” says Tim Hardy, author of the UK-based blog Beyond Clicktivism. But the model has its limits. In Egypt and Tunisia, where protesters successfully ousted President Hosni Mubarak and Zine al-Abidine Ben Ali, there are already signs the protesters are being sidelined by more established power centres. In elections likely only weeks away, the westernised activists of Tahrir Square may be barely represented as power shifts back to the military — who remain in control — and the more organised Muslim Brotherhood. In Libya and Syria, where popular uprisings turned into outright armed intervention and insurgency, initially leaderless rebels found themselves at an immediate disadvantage. Whether at the ballot box or on the battlefield, some experts say that without some form of command and control leaderless groups will simply be outmanoeuvred. That might leave them a simple choice: build more coherent leadership structures or join with other organisations that already have them. That can prove difficult. One of the strengths of the “leaderless” model, protesters say, is the way it can quickly bring together disparate groups working towards a common goal. But as frustration mounts, so does demand for change. On Libya’s stalemated eastern front, fed-up rebels say they want their commanders to build more unity and better discipline . In Britain, groups of left-wing anti-austerity activists are torn between the idea of joining the opposition Labour party, starting their own to challenge for parliamentary seats or sticking with largely peaceful direct action . Some of Egypt’s young protesters are working with Serb activists who ousted Slobodan Milosevic in 2000 to build more coherent strategies, contest elections and build lasting structures to hold authority to account . There are risks that without a formal decision-making structure, the room for error is huge. Some are also concerned about the radicalism of emerging cyber entities such as Anonymous and Lulzsec, “hactivist” groups who were behind a string of recent attacks on government and corporate targets. Both groups are believed to have a “leaderless” structure but there are signs that Lulzsec at least is already being undermined by internal feuding . Like Islamist networks such as Al Qaeda — whose central leadership was weakened after September 11 and is now believed to consist largely of semi-independent franchises — leaderless organisations might sometimes achieve big spectacles but struggle to have a lasting impact.